The rest of the day, Lenai showed Jason around the Haven, telling him about the different areas they passed through. Everyone they met showed the utmost courtesy and respect to him. He couldn’t believe people actually bowed as much as they did. Before long, he found himself bowing in return. It sure is different from back home. It wasn’t just the fact that almost half of the people he saw weren’t human, but that everyone seemed to be genuinely concerned for his well-being and comfort. At every turn, it seemed like he was being offered a freshly baked roll or a piece of fruit. One woman even gave him a tunic she had just finished making. “I couldn’t accept this,” he protested. Behind her, a man he assumed to be her husband beamed at her. A little boy rode on the man’s shoulders, apparently the couple’s son. The boy grinned down at Jason from his lofty perch. Jason smiled back, and examined the garment. It was a beautiful piece of craftsmanship, with an intricate pattern embroidered at the shoulders and waist. The woman smiled, clearly pleased. She returned his bow, although much more gracefully. “You honor me.” Her husband watched with a look of pride on his face that touched Jason in a way he couldn’t quite understand. “That was kindly done,” Lenai said, as they walked away. “Well, it’s a really nice shirt,” he replied. She didn’t say anything else. Later in the day, a group of small children playing in a commons area accosted them. When they spotted the two, the children ran toward them as fast as their little legs would carry them. Short, downy hair covered their heads, and each had large buckteeth underneath a small, button nose. The only thing he could think of was a cross between a human and a chipmunk. “Lenai! Lenai!” they shrilled as they approached. They were suddenly waist deep in a sea of small furry bodies, all waving their hands in the air as they tried to get the Shanthi girl’s attention. Lenai raised an eyebrow. Then she turned back to the children. “Me first! No, me! Me!” echoed a chorus of voices. One young boy came forward with a toothy grin as the other children backed away, giving them room. Lenai picked the boy up and held him up over her head. Then she vanished. “Look at me! Look at me! I’m flying!” the boy crowed, seeming to hang in midair. Jason laughed as he watched the boy ‘flying’ around the commons area. Garen, the wonder chipmunk. He tried to spot any sign of Lenai, and then shook his head in amazement. He couldn’t see anything at all underneath the boy. Several of the adults nearby yelled encouragement. Clearly, this was a favorite game in this quarter, and everyone seemed completely at ease with the Shanthi girl as she played with the children. When Garen’s turn was done, Lenai reappeared and selected another child. After every child had been given a turn, she walked back over to him. Lenai didn’t say anything as she came to a halt. She looked at him impassively, waiting for his question. “The Shanthi also have the ability to sense others of our race,” she explained. “I will demonstrate. There are currently two other Shanthi within Lore’s Haven.” She looked at a point over his head and her face took on a distant, unfocused look. After a moment, she said, “One is in the west tower, the other is in the training yard. There are none that I can sense outside of the Haven.” Her eyes refocused and came back to rest on Jason. He nodded and they headed back toward his room. An hour later, Jason watched from his window as the sun slowly dropped below the distant horizon. From this point, he could see that the keep stood on a plateau. Not far away the land dropped off toward a forest below. A knock at the door pulled his attention away from the picturesque view. When he opened his door, he saw Reyga and Lenai waiting for him. “Are you ready, Jason?” the Loremaster asked. “Good,” Reyga said. “Shall we go?” He started down the corridor, with Jason falling in beside him. Lenai followed behind. As they passed through the halls of the Haven, Jason admired the intricate tapestries lining the walls. Some were merely colorful designs, but others depicted various scenes and pictures. There were woven patterns showing heroic battles, simple forest scenes, and the occasional depiction of village life. The halls themselves were filled with people strolling this way and that. Just as earlier with Lenai, anyone they met stepped aside to let the party pass, bowing or nodding courteously at the trio as they went by. Eventually, they arrived at a large set of double doors. Pages on either side swung the doors open with a flourish as they approached. His jaw dropped as they walked through the doors. He felt as if he had stepped into the dining hall of a giant. The banquet hall was in the shape of a semi-circle at least five hundred feet across. A raised dais stood at the straight side, directly across from the doors they had just entered. He stared in awe at the soaring arched ceiling overhead, reaching its distant apex directly above the dais, with banners and streamers hanging from it in a gala of colors and patterns. Along the wall behind the dais towered intricately patterned stained glass windows whose colors matched the banners. He saw people entering through two other sets of double doors in addition to their own. Several rows of curved tables followed the contour of the walls. The overall effect was of a group of arcs nestled one inside the other. The guests sat facing the main table on the dais, while the servers moved along the inside of the curves, keeping goblets filled, and replacing empty trays of food. Two aisles radiated from the center of the dais, separating the room into three sections, and allowing the guests and servers to reach their places with ease. The room looked like it could easily seat at least a thousand people if not more. About a third of the seats were already filled, with more guests arriving by the moment, each guest’s arrival being announced equally as stridently as had been their own. The drone of dozens of conversations filled the room. “We will be sitting at the main table in the front,” Reyga said. He looked toward the dais and saw that his father was already seated at the table, waiting for them to join him. After several stops for introductions and small talk, they made it to their seats at the main table. His seat was the second seat from the podium, with his father beside him in the third seat. The High One took the seat beside the podium, and Reyga occupied the seat next to Jason’s father. The remaining members of the Circle filled the other seats. He noted a number of different races dispersed among the crowd as the guests found their places. The servers were human, for the most part, with a few of the ‘chipmunk’ race he had seen earlier as well. Lenai said they were called Rodinn, but he couldn’t get the chipmunk image out of his mind. Once everyone had been seated, with only a couple of stragglers hurrying to their places, the High One stepped to the podium. The murmur of conversation died to silence as he waited. After a round of polite applause, Tal continued, “Enjoy your meal, and afterwards please come and bid Jason welcome to our fair world.” With a nod to the room, Tal returned to his seat. The sound of clinking silverware and spirited conversation filled the air as the guests turned their attentions to their plates and dining companions. After a first hesitant bite, Jason’s appetite reasserted itself, and he set to his meal with enthusiasm. He found the food delicious, even though he couldn’t identify most of it. His father apparently had no culinary objections either, judging by the gusto with which he attacked his plate. Halfway through the meal, Reyga rose from his seat and raised his goblet. As they noticed him, the other Loremasters and guests quieted. When the room was silent except for the whispery sounds of the servers, Reyga spoke. Jason reviewed their journey as he chewed, trying to remember exactly how he had ‘honored’ Reyga during their travels. Tal smiled graciously and, along with the other dinner guests, raised his goblet, waiting for Reyga to finish his toast. Jason’s eyes widened as he realized what the Loremaster was about to say, but it was too late to stop him. The sudden sound of spluttering and choking interrupted him. He looked down to see Jason coughing and red-faced, with part of his meal dropping down his chin onto his plate, while his father pounded him on the back. He glanced sideways at his father, who was looking at him with his lips pursed and one eyebrow raised suspiciously. He gave his father a sheepish smile and a shrug, and then found something profoundly interesting to stare at on his plate. Reyga finished his toast and sat down. The rest of the meal passed without incident. Later, after an hour or so of introductions, welcomes, and small talk, Jason finally made his way back to his room. As he collapsed onto his bed, he renewed his vow to watch his tongue around Reyga. As Lore’s Haven slept, ten days’ journey to the south, the village of Brayden Fenn also slumbered, peacefully nestled among the ancient trees of Faedor Woods. A dog dozing outside one of the houses was awakened by rustling in the branches and leaves overhead. The dog growled softly as the sound came closer. Before it could react, a silken net dropped from the canopy above and ensnared it, jerking it up into the trees. There was a barely audible yelp, and then all was silent again. Scores of shadowy figures descended on glistening silken ropes into the village. Without a sound, they began entering houses, one after another. Muffled screams and final rattling gasps were the only indications of what was happening behind the doors. Then, a piercing scream shattered the darkness, as one woman managed to evade her attacker long enough to alert the village. Her scream cut off, but not before the windows of several nearby cottages lit up. Men came out, swords drawn, to investigate the scream. Their wives, some of them armed as well, gathered children together. Two of the men met between their homes. “What is it, Koryn?” Cale asked. He scanned the village, sword at the ready. “I do not know,” Koryn answered. Just then, from the door of the house across the lane, a shadowy form seemed to flow out the door. As they spotted it, both men gasped in horrified shock. The creature looked around, head cocked, as it listened to the sounds of the village awakening to the threat. From the waist up, it had the appearance of a human, but below that was the hairy body and legs of a spider the size of a pony. Its face was human looking as well, except for the two large, ebony orbs where the human eyes should have been, and the six smaller orbs encircling the rest of its head. Cale turned toward the town center, where the contact portal to Lore’s Haven was, with Koryn right behind him. Cale had only taken a few running steps, when he heard a shocked gasp. He felt a hand brush down his back and saw Koryn’s sword slide past, the metal blade kicking up sparks as it scraped against the rocky path. Cale turned to see Koryn on the ground, a silken rope entangling his ankles, with a monstrous Manarach pulling the other end of the rope hand over hand. Cale was frozen by indecision. He knew Koryn was right, but he could not bear to leave his friend. Then it was too late. Koryn was in the creature’s grasp. 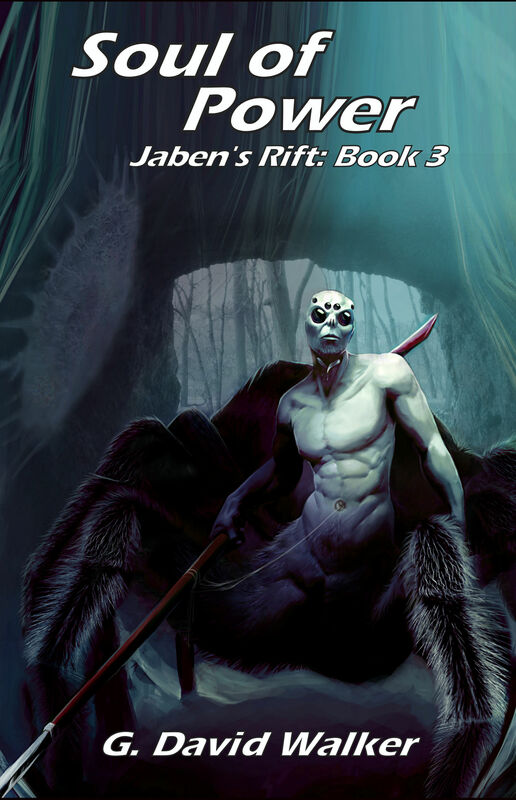 The Manarach’s hands trapped Koryn’s arms behind him, and one pair of its legs imprisoned him about the waist. The creature raised its head up, as if looking into the branches overhead, and Cale saw a pair of fangs as long as his hand emerge from folds of skin in its neck. “Cale, please!” Koryn cried. “In the name of all that we hold dear…GO!” Then he stiffened, lips pulled back over his teeth, as the creature’s fangs pierced his back. With his friend’s final look of agony seared into his mind, Cale sprinted toward the center of town. All around him he could hear the horrific sounds of men, women, and children screaming as the Manarachs’ relentless slaughter continued. He turned the last corner and saw the meeting hall. Even though his village was lost, if he could alert Lore’s Haven, the Circle would be able to meet this threat. Reaching deep inside, he somehow found the strength to increase his speed. Finally, after what seemed like an eternity, his foot hit the first step to the small building. Just as he reached for the door, a net of sticky strands enveloped him. 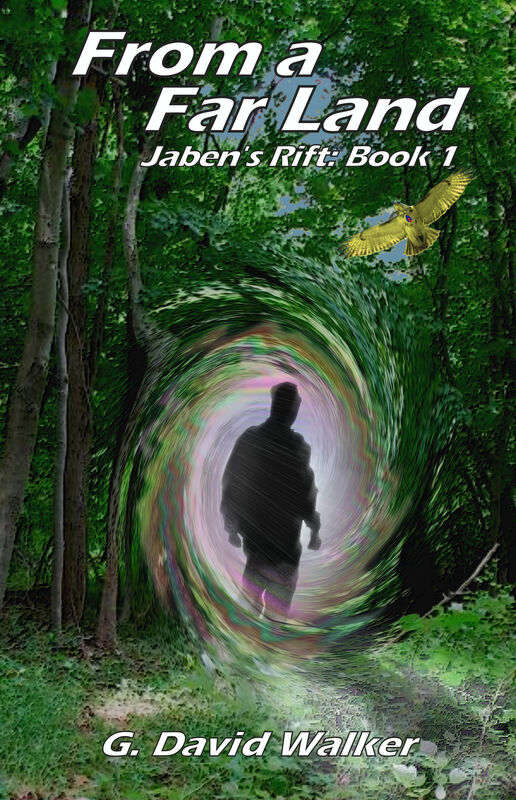 He felt himself rising off the ground, being pulled into the foliage overhead. “Goodbye, father,” he whispered, just before he felt the vicious fangs drive home. At the same time, three days’ journey to the east of Brayden Fenn, on the banks of the Shonta River, the village of Dronnin was meeting a similar end. Instead of the silent Manarachs, however, Dronnin’s fate came at the hands of scores of hissing Trellin. Because the Trellin did not possess the stealth of the Manarach, the men and women of Dronnin were able to mount a defense of their small fishing village. It made little difference, however. The onslaught of reptilian warriors quickly transformed the dirt streets of Dronnin into a bloody quagmire, oozing down the riverbanks to form a dark crimson cloud staining the clear waters of the Shonta. 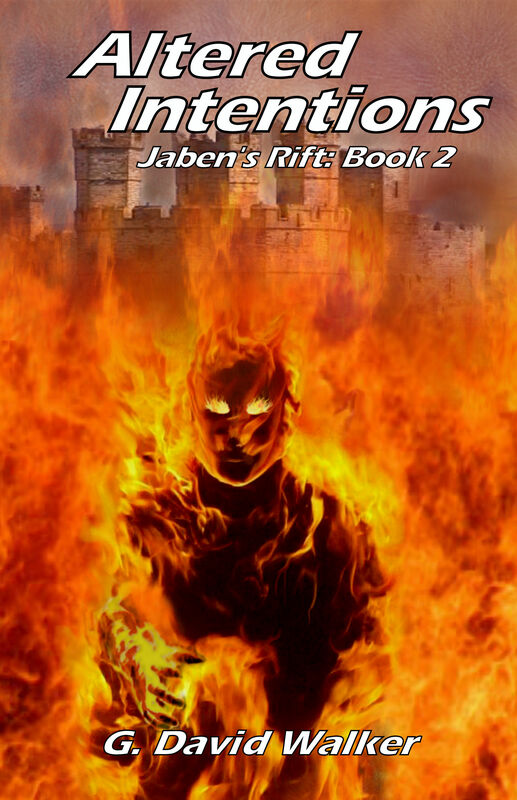 Posted on April 16, 2017 May 3, 2017 by Dave WalkerPosted in Jaben's RiftTagged Fantasy, Jaben's Rift.